The May Centre celebrated today with a Summer lunch provided by the fund raising committee, attended by members and volunteers. 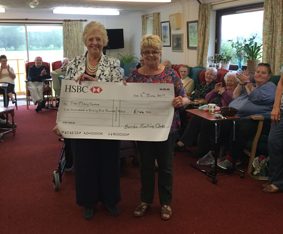 A cheque for £166 was presented to the centre manager, Joyce Wilson, on behalf of Beccles Amateur Sailing Club by Janet Forster-Warnes. The donations were collected at the sailing club’s recent fun day, marking their own 110th anniversary.